Opening hours: Government offices are open at 9:00 AM - 5:00 PM on weekdays and close on weekends. Banks are open daily throughout the week at 9:00 AM - 5:00 PM. Most stores and shopping malls are open at 9:00 AM - 9:00 PM daily. Most of Ningbo's attractions lie outside the city limits - the countryside boasts an abundance of scenic natural areas teeming with striking Buddhist temples inviting for a day-long field trip (Tiantong and Baoguo Temples top the list of those most attractive to visitors). Venturing even further out is the unspoiled Yushan Island. Inside Ningbo, sights not to be missed include China's oldest library Tian Yi, the historic Drum Tower and surrounding areas as well as Laowaitan neighbourhood at night. 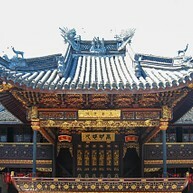 The city's main attraction and a huge source of pride, the Tian Yi Library is the most historical library in Asia. The library complex contains multiple historic artefacts and is a pleasure to simply walk around and admire the ancient building while strolling through tranquil gardens and courtyards. 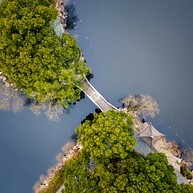 Yuehu, which literally means Moon Lake, is in the south-west of Ningbo, was first turned into a cultural and academic centre during the Song and Yuan Dynasties. Nowadays it is the main recreation area for many locals who come to play chess, practice the martial art of Tai Chi, dance or just enjoy the beautiful views. 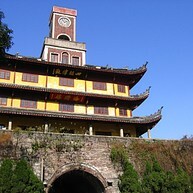 The Drum Tower, which constructed during the Tang Dynasty, is the only remaining ruin of an old city gate tower in Ningbo. At the top, there is a six-meter high Romanesque bell tower added in the Republic period. Around the base of the tower is a commercial area where all the buildings are reconstructed in the traditional style. 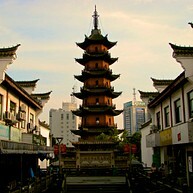 Tianfeng Pagoda is 120 years older than Ningbo city itself. During ancient times, it was served as a lighthouse that directed passing ships. Today you can climb the stairs all the way to the top and from there take in a panoramic view of the city. 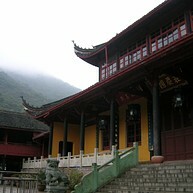 The Catholic Church in the south of Tianyi Square was built in 1702 by a French missionary. This classical Gothic-style cathedral consists of a hall (31 meters in height) and two bell towers that are 66 meters high. The Old Bund has witnessed the development of Ningbo as a port city, with English, French, German and Dutch-style architecture evoking memories of the 30's and 40's in this cosmopolitan hub. There are a number of evening venues in the area, most operating during the summer months. For a scenic day trip, head to Yushan Island, a beautiful and secluded formation. Tourist infrastructure is little developed here, with a few resorts and a picturesque lighthouse set against the backdrop of crystal-blue sea water. During the night, you can look at the sky and even see the magical blue tears, the mysterious blue lights spotted along Yushan Island. This Buddhist Temple, which sets in a hilly area about an hour long bus trip away from Ningbo city, is a perfect venue for a day trip. Hiking uphill is a pleasant experience with the clarity of the air, scenic views, and multiple smaller temples along the way. This little village has over 600 years history and was constructed on a hill with one side open to the sea. The wall of the village traces the mountainside, going up and down. There is a whole street of seafood restaurants near the port where one can savor the freshest seafood and the most authentic Ningbo dishes. 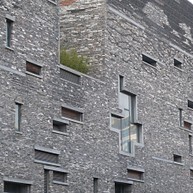 The museum itself is a wonderful piece of art and has won several international architecture prizes. The most interesting part of the exhibition would be the folk culture hall, where a whole street featuring shops of traditional handcrafted art was created inside the building. 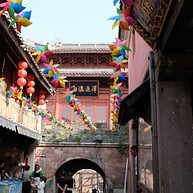 This place will take you back in time and offer a closer look at the old Ningbo City.